Eric is a graduate of Providence Catholic High School. He helped his team to a 50-game winning streak and three consecutive state championships. As a senior he had 46 tackles, 55 assists, and a school record 26 QB sacks on his way to being named conference MVP and first team all-state. One of the top high school players in the country, he was named Super Prep and PrepStar all-American. Since 2003 Eric has started 124 of 125 games. 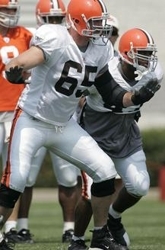 In 2007 Eric accepted a contract for 7 years worth $49.5 million with the Browns. On Monday August 19th of 2013, Eric returned to the field he left so long ago. Before there were two fields or even a tower, Eric played on what is now "Kevin Killmer field" in this great sport of football we teach. Learning just like every other little guy that first plays, the basic fundamentals of blocking, tackling, passing, and receiving. Now after regularly playing with Providence high school, the Iowa Hawkeyes, the Cincinnati Bengals, and the Cleavland Browns he has returned to give back to the area kids where he started. Monday night was a huge success for the return visit of former Homer Stallion and NFL player Eric Steinbach. Eric signed close to 400 autographs and took time to talk to each player and signed extra items for them as well. Special thanks to Kerri Treacy for designing the bio-sheet that was given to every player, and Jeff Schultz, whose company donated the printed copies. Also thanks to the Stallions board and all the coaches that helped make the night fun for everyone. Eric said he will return again, more info and details to come later. All the Stallions would like to Thank Eric for taking the time to come out and once again be a part of the Stallions. Nick was signed by the New Orleans Saints as an undrafted free-agent on May 13, 2004. He also served time with Tampa Bay, Chicago, Cleveland and Buffalo. On December 12, 2006, he signed as a free agent with the Hamilton Tiger-Cats of the CFL. He scored a league leading 167 points in his first year in Canada. He was also named a CFL All-Star. Nick was one of Hamilton's captains in the 2009 season.